Starting a new Self-Hosted WordPress should not be technical and complicated for a newbie. Also, the cost of starting a blog shouldn’t make a hole in your pocket. 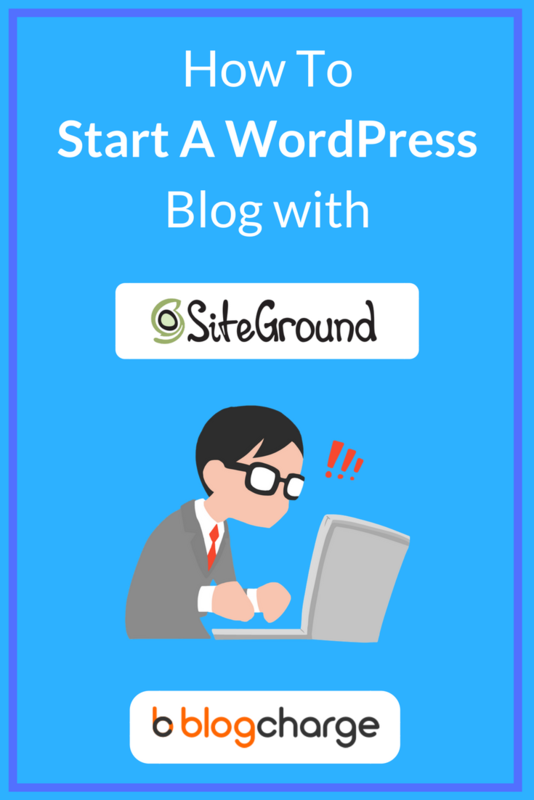 In today’s post, I will walk you through the steps needed to Install WordPress with SiteGround Web Hosting. 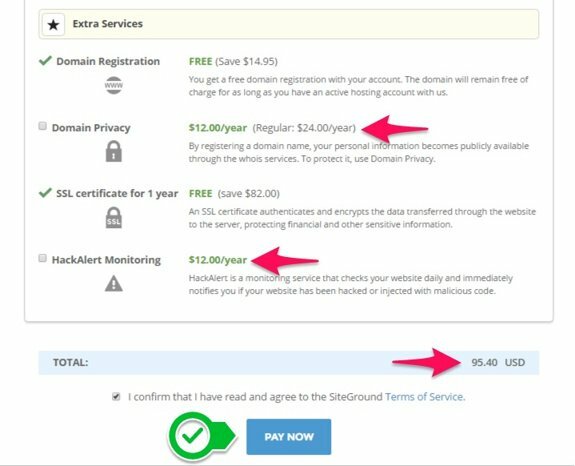 Why SiteGround? Here’s my point of view. SiteGround is a favorite web hosting provider which is known for its quality and affordable prices. It was founded back in 2004, and currently, it is powering more than five millions domains worldwide. Having multiple data servers ensures your site gets maximum speed from the nearest location. You can choose the closest data center from your targeted country. Apart from it, features such as FREE domain name, SSD storage, FREE SSL certificates, website migration, and 30 days money back guarantee to make SiteGround stand out from the crowd. If you want to start a blog that can handle enough traffic and provide 99.9% uptime, then SiteGround is the best choice. Moreover, you can enjoy up to 60% discount over regular prices for a limited time from links on this page. Know more about SiteGround web hosting. The first step is to decide on which plan you would like to buy. Your choice of a plan can depend on various factors such as your budget, the number of sites you want to host, and what kind of website you’re planning to launch. SiteGround comes with multiple plans each with different features and price. Click here to go to the pricing page. For beginners, the ‘StartUp’ plan is recommended that starts at just $3.95/month. It will let you host one website and can handle up to 10,000 visits per month. 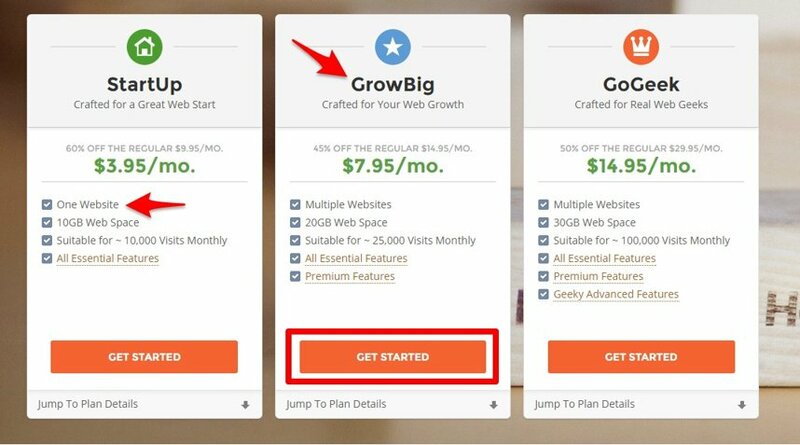 If you want to host multiple sites, then do choose “GrowBig” plan which cost $7.95/month. Next, click on ‘Get Started’ button of the selected plan. On the next page, you will be asked to register a free domain name. You can enter the desired name you want for your website or chose to use a domain you already own. 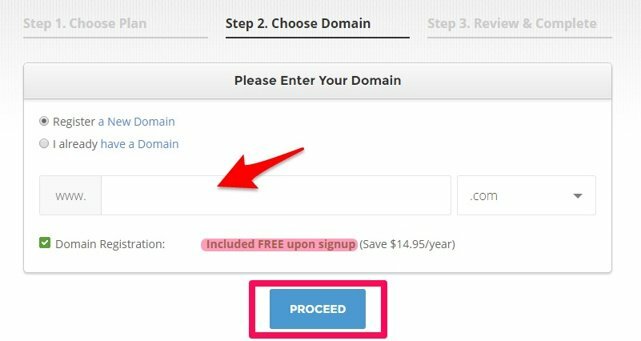 ** The domain name is free for the first year and saves you around $10. So, do take it. If you haven’t yet thought of a domain name, then read my guide on finding a brandable domain name. Next screen will ask for details about your account, client information, and payment information. Provide accurate information as the account login details will be emailed to the given email address. The fourth section i.e. Purchase Information will let you change hosting plan, data center, and the hosting period with one click. There are certain “Extra Services” marked by default. You can untick Domain Privacy and Hack Alert Monitoring to save the unwanted cost. The total amount to be paid will be $95.40 for GrowBig Plan with 45% discount on regular prices. Click on Pay Now button to complete the payment. Once your order is successful, you will receive login credentials in your email inbox. Upon receiving your credentials, head back to SiteGround Homepage. Click on the Login button situated at the top right corner of the screen. Enter your login details and sign in to your account. On the next page, click on ‘My Accounts’ tab. It will display all the information about your web hosting and DNS information. ** You can get your FREE SSL certificate by going to ‘Extra Services’ tab. Click on Access CPanel button which will take you to your personal Control Panel Account. Control Panel or commonly called CPanel is used to manage your website, and it is where you’ll be installing WordPress on your domain name. 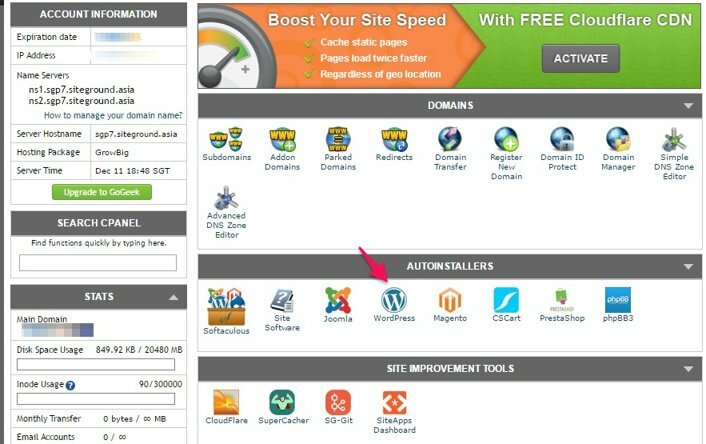 Under Autoinstallers section, click on WordPress for quick WordPress installations. Alternatively, you can also choose Softaculous which is a one-click installer for many applications. On the next screen, you’ll be provided with information about WordPress and a button to install it. Click on ‘Install Now’ which would take you to the software setup page. Choose whether you want your site to be http://yoursite.com or http://www.yoursite.com – personal preference. I like to use www version, but many of the top bloggers prefer non-www for their website. Update: I switched to non-www version since I wanted smaller URLs. You can also choose the https version of the same (recommended) since you’d anyway be installing an SSL certificate provided for free by SiteGround. Scroll Down, and enter your site name, description, Admin account details, and the Language of your WordPress. ** Do not leave the admin name as it is and do try to have a secure password. Security is important for your blog. After filling the details, click on ‘Install’ button situated at the bottom. 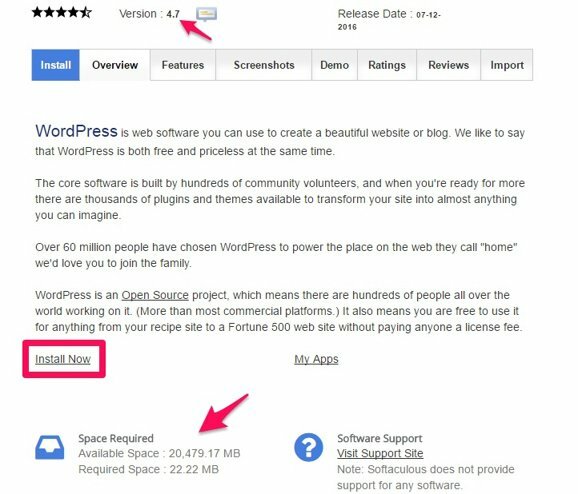 Installation of your WordPress will install, and it may take around 1-2 minutes. Next, you will be greeted with congratulations screen with some details. You’ll also get an email from SiteGround confirming your installation and your username. You can now access your WordPress dashboard by clicking the link given or by typing www.yoursite.com/wp-admin/ on your web URL bar. Use the Admin login details to log in to your WordPress Dashboard. Tada! Your site is live, and you are ready to publish your first blog post. Starting a blog has been both easier and affordable, and it’s the right time to start your personal website and get your online presence. 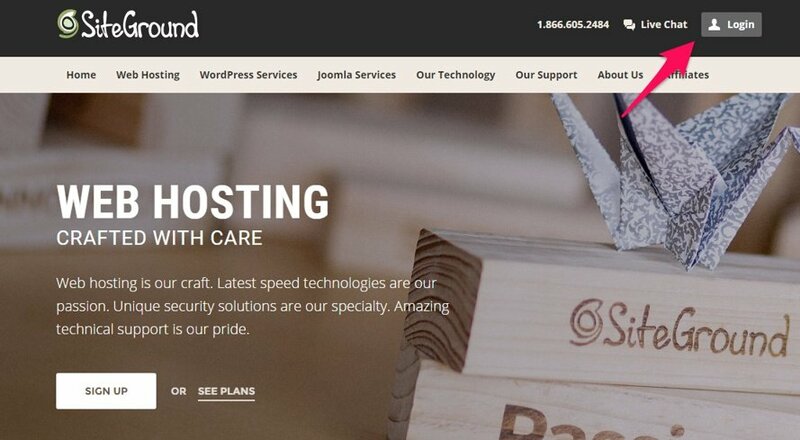 Let me know if you’re facing any problem during installation of WordPress on SiteGround Hosting. I’ll be right around the table to help you. Don’t forget to share this post with your friends and followers. Sharing is happiness. Disclosure: Links on this page contain Affiliate Links that will get me some commission if you happen to shop through these links. Thanks for supporting my blog. You have done an awesome work, producing such a Useful content. Buying Webhost and Installing wordpress is not less than a headache for a newbie. It will definetly help them. Very nice article. Heard about Install WordPress With SiteGround, Personally i like WordPress because easy to any customization. It is seo and user friendly. WordPress is the best blogging platform than others. Thanks for the good information though. I agree Pavitra. Installing WordPress is pretty easy and anyone with basic understanding of internet can now start a blog with help of it. My first visit on your blog, you had a great informative stuff on your blog. Thanks for sharing all the useful tips and guide. Have a great blogging journey. Thanks for the kind words & glad you find the blog helpful. Keep visiting. Thanks for such detailed information it helped me alot..appreciate your hard work and wish you more success ?